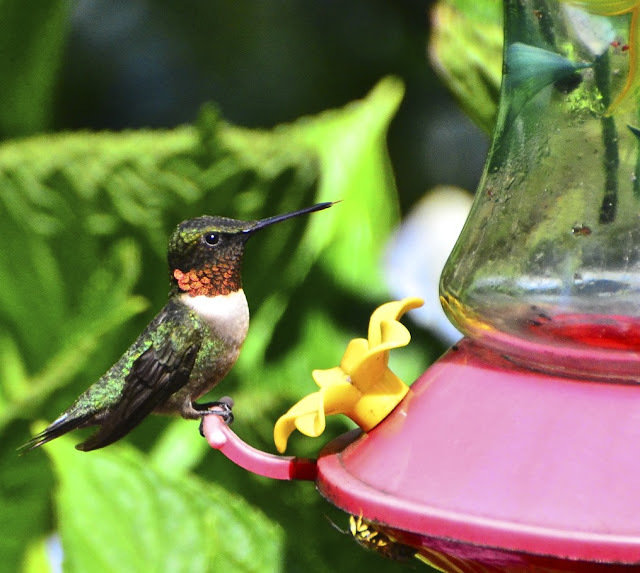 The hummingbirds are back in full force. And I'm delighted to say that more have decided to stop in this year than last. So far I have counted 6! There may be more but who can follow them that fast! All day outside my office window, I watch them come and go. Unwilling to share their tasty bounty. I have no idea who they consider friend or foe. But their fights and flights are constant all day long. Even when I sit within feet of their feeder, they are fearless of me. how to get in my sunflower feeder while I was gone. This little girl planted herself in there for over an hour yesterday off and on. Guess she has grown tired of eating the leftovers tossed to the ground! It's amazing she was able to maneuver herself in there, clumsy as they are. Hope your week is going well, my friends! And by the way, I'm not done with Maine pics. 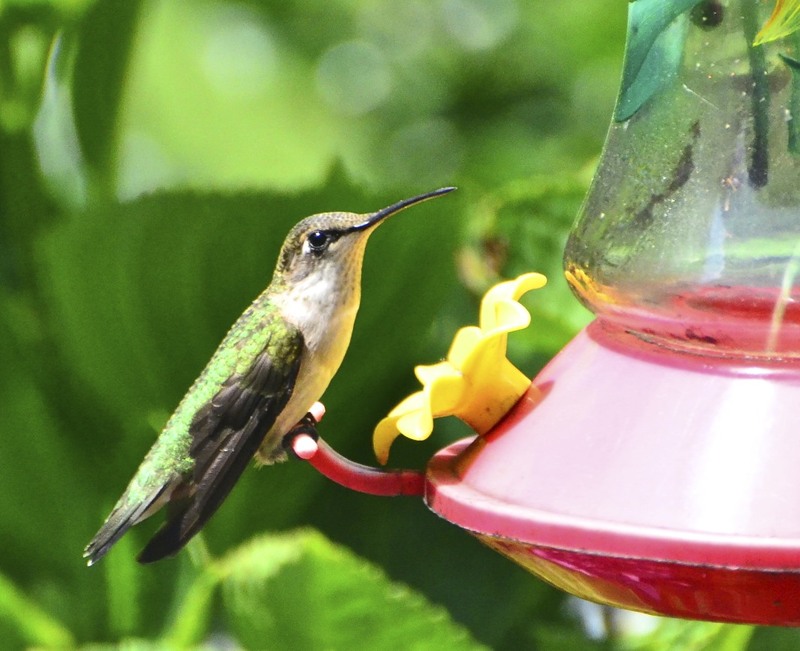 We've only had two sightings of hummingbirds this year. :( Love yours!! You're so fortunate. That dove looks like it broke into that house. Lordy, she really doesn't fit. Poor girl. Great captures! 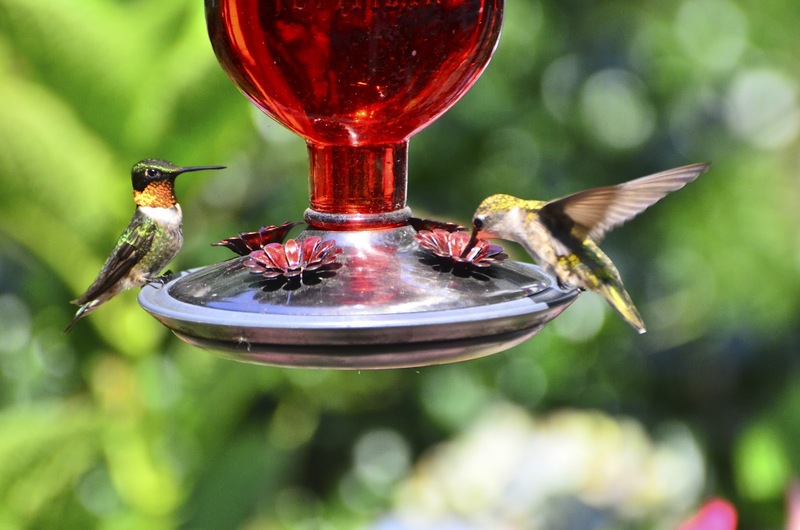 wow, such amazing shots.I love those hummers and set up lots of feeders, but they still argue over food. I love them too and you captured them so well. I had to chuckle at that determined dove! Bless her heart! Not many sightings down here so far this year. Your B&B must be the talk of the East Coast! :-) Fantastic captures! 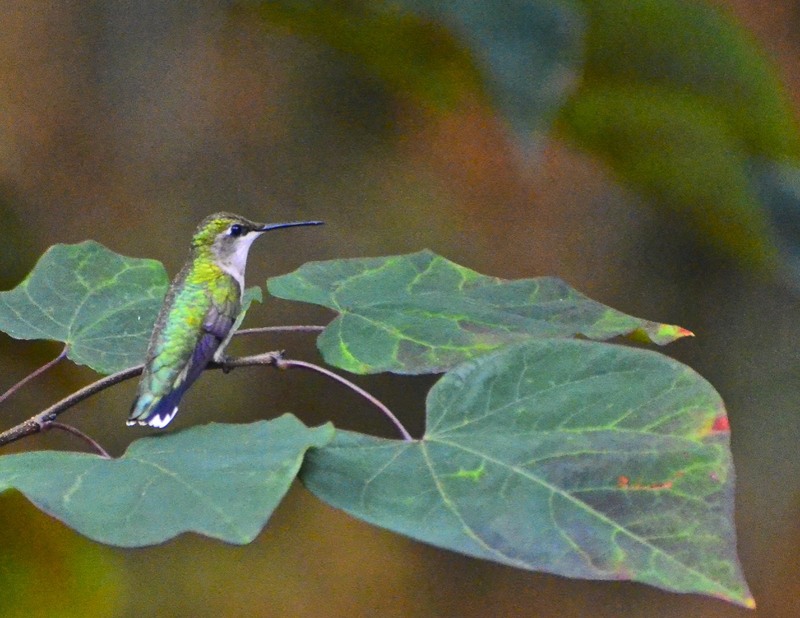 Such gorgeous, colorful little hummingbirds and your captures are exquisite! And what a clever mourning dove! I wonder if he had to grease his feathers to slide in there!! What a lovely, bright spot for my morning, Reena!! Thank you! Great shots! I just love hummingbirds you have captured their energy so well! I love the pics. I was excited this week to see a yellow finch in our yard. Thanx for the lovely pics of the birdies. So inspiring. Cheers!! 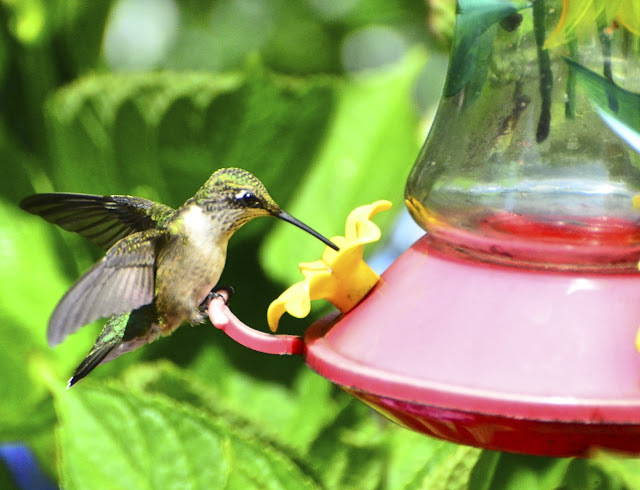 I love hummingbirds! We often little dogfights over the feeder in our yard as well. I know of a place that has 5 or 6 feeders out at all times and sometimes there are 20 or more humming birds buzzing all about. Nice photos! that silhouette capture is really unique. gorgeous color! YAY THE MORE HUMMERS THE BETTER! 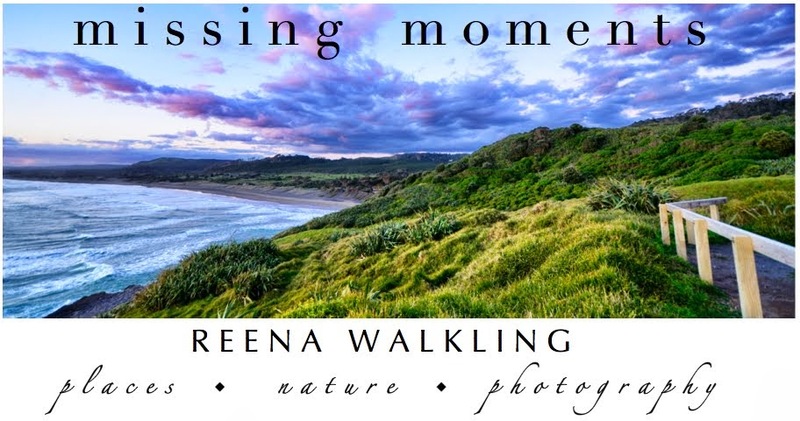 These are amazing photographs Reena. I am thinking mourning doves are not that bright either. For weeks, maybe months our pair have been scratching about on the ground below the feeders for scraps that have fallen. It is only in the last week or so I have finally seen them up in the flat tray that was above their heads all this time, getting the first serving. I've never seen a Hummingbird in real life. They are so cute. But I do have a lot of Morning Doves though! Aren't they wonderful, though!!! If you are just now seeing them "in full force," I wonder if they are storing up for migration? I've had the same number almost all summer long---a few here and there. Both of my feeders are being used, though. I wish I had a location to photograph them as you do. Beautiful pictures. I don't have a feeder out but the hummmers are sure going after all my flowers. 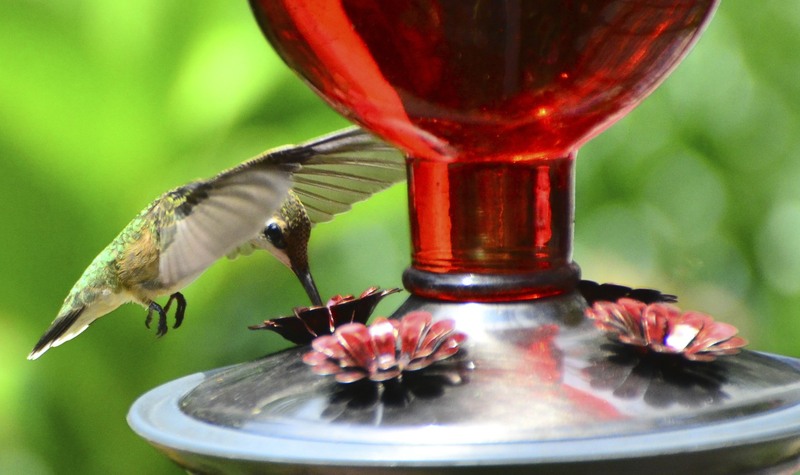 Stunning photos of these hummingbirds Reena! 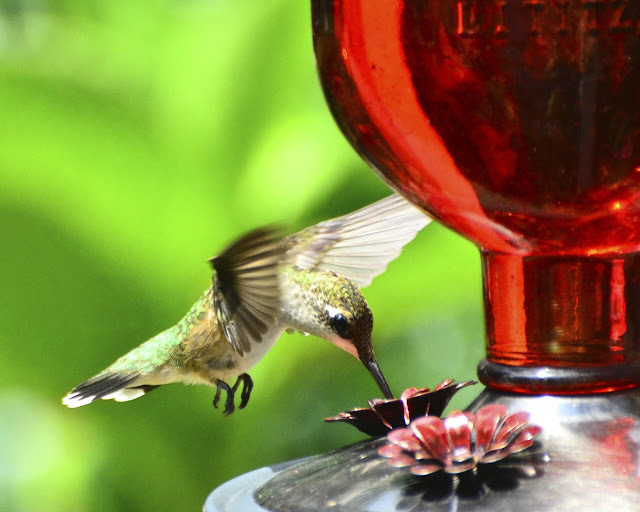 Makes me really think about getting a new lens:) We have at least six hummers visiting daily too and I love watching them fight and feed all day long. They now don't mind if I am sitting out there rather close to them:) This reminds me that the feeder needs to be refilled early tomorrow morning! Lovely captures of the hummingbirds. They are such amazing little birds. 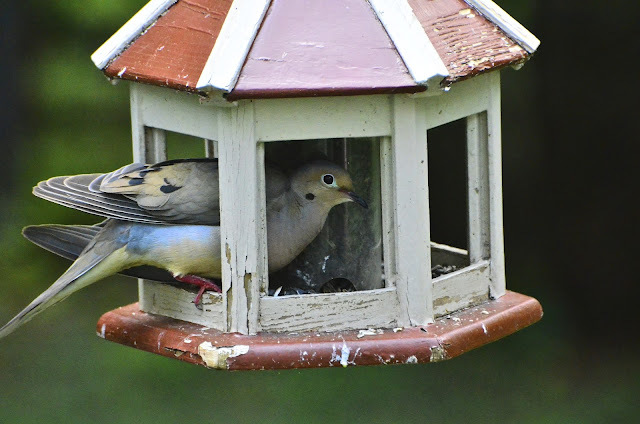 I love the shot of the dove in the feeder too. These little guys can offer up hours of entertainment! We have two or three pair here and the wars go on all day between the males, buzzing and dive-bombing each other - and sometimes me! Flight or fight, is the way of survival. 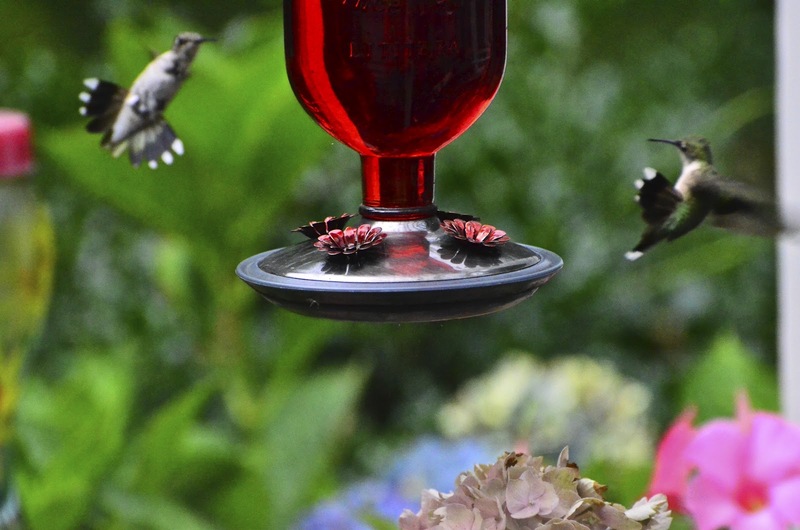 Fun little hummers ... great shots. 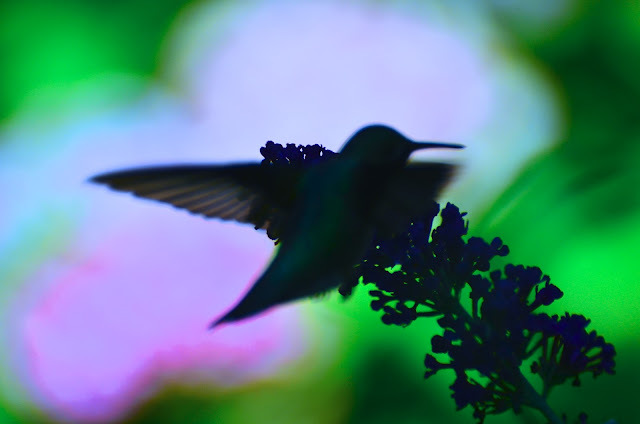 I simply love hummingbirds, they always seem so delicately beautiful. Haven't seen many here this summer but we've had to pack away our feeders because we're moving soon. 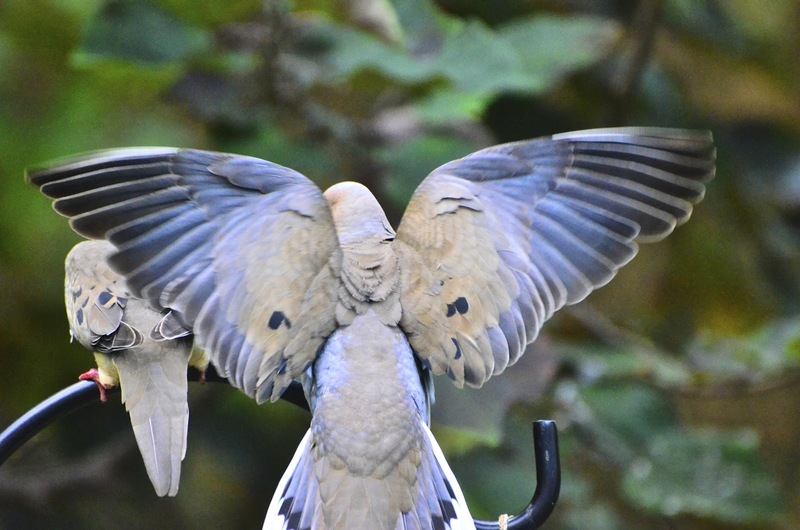 Love the shot you got of the dove too, incredible. All of these photos, but especially that first one, make me ohso thankful for our feathered friends. Glad I stumbled here this morning! You know I love popping in here and seeing the birds from you backyard. 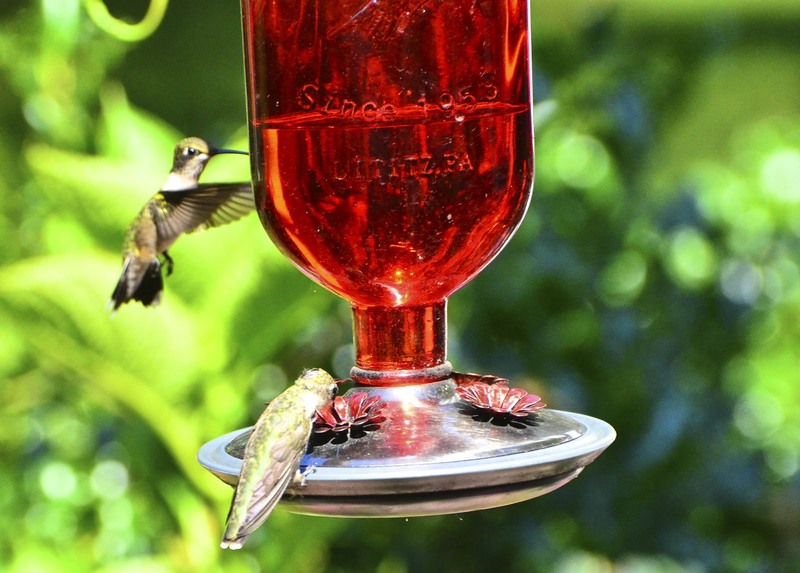 I have two hummingbird that hangout at our feeder. And boy do they fight over it.. Fun to watch.. Cant wait to see more of you Maine photos. Great pictures - I need to organise my life so I can see sme of these splendid birds! Great post about the boat as well. How do you get anything done? I would just sit there and watch them all day long :) Beautiful! Lovely, I have missed those little hummers whilst they have been away.